One of the tools available to infection preventionists, hospital epidemiologists and healthcare practitioners is the antibiogram. While not all facilities or networks will have an up-to-date version of this report, they are becoming more common. 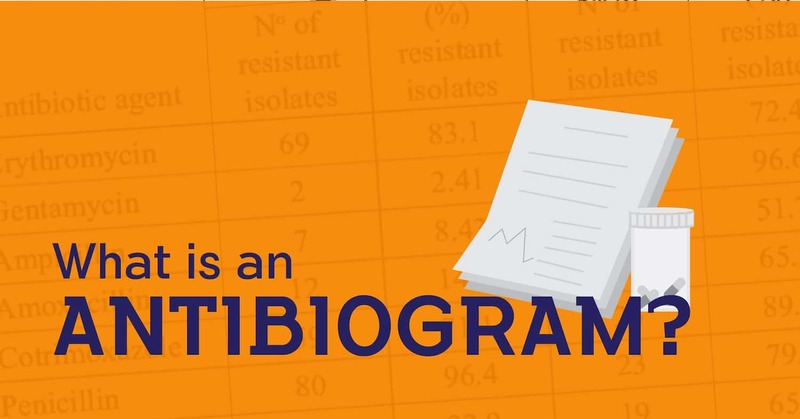 What is an antibiogram and how can it be used? In simple terms, an antibiogram is a report that shows how susceptible strains of pathogens are to a variety of antibiotics. As you may know, not every antibiotic works the same way. Some pathogens require one antibiotic, while others require a completely different antibiotic. However, some pathogens that used to be susceptible to an antibiotic become gradually resistant to it, limiting the numbers of drugs that can be used to destroy it. In today's post, we'll unpack this definition and see how these reports are used today. At the patient level, a drug susceptibility report can be provided to the doctor to help choose the correct antibiotic. A sample from the patient is sent to the lab, where a technician tests it against a panel of antibiotics at various levels of concentration (to see how much of the drug is needed to kill the pathogen). Finally, the samples are observed for visible growth of the pathogen. They are looking for the Minimum Inhibitory Concentration (MIC), the lowest concentration of the drug that shows no pathogen growth. Depending on the pathogen/antibiotic combination, there are predetermined levels of concentration (think of this as a "dose") required to have the pathogen labeled as "susceptible". These are called breakpoints and serve as a boundary between the four possible labels: Susceptible, Susceptible - Dose Dependent, Intermediate, and Resistant. The final report will give the healthcare team vital information to help them choose the best antibiotic for their patient. The antibiogram isn't the final say on the choice, however. Physicians will still need to take into consideration the age, degree of illness, and antibiotic history for each patient before making the final decision. The antibiogram data does not only inform the team of one individual patient; all together, the collected antibiogram reports can be aggregated into one hospital-, network-, or even region-wide antibiogram. Studies show that antibiograms vary greatly between facilities, even those located one block apart, so the information from a local level to a regional level can provide great insight into trends and points for additional investigation. While this report does not include the MIC, it provides the susceptibility rate of a variety of pathogens to a panel of antibiotics in the form of a percentage - the percentage of tested samples that were susceptible to that particular antibiotic. Here's a sample antibiogram from Hawaii. This big-picture antibiogram helps in individual cases by bridging the gap between when the infection is sampled and when the results come back from the lab. Often, a patient will be sick enough that waiting for those results would put them at tremendous risk. The doctor needs to choose the best empiric antibiotic therapy - the best treatment prior to receiving the individual lab report. A doctor can refer to the hospital antibiogram to see the trends in how susceptible that strain is to the antibiotic choices. If the pathogen susceptibility rate to a particular antibiotic is around 80%, the doctor should select a different antibiotic. If the patient is critically ill, a susceptibility rate of 90-95% might be better. This report helps the doctor make a more educated "guess" about which antibiotic will most likely eradicate their patient's infection. In an era of growing antibiotic resistance, the use of antibiograms will surely become more prevalent. They are costly and time-consuming to create (and to update annually, as the Clinical and Laboratory Standards Institute recommends), but are becoming more and more prioritized by infection control teams. Does your facility use antibiograms? We'd love to hear how you and your team integrate this data into your daily work.